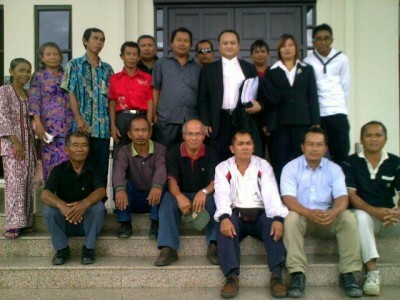 KUCHING – On February 21 2011, the Kuching High Court delivered its judgment in favour of the Plaintiffs who are the Ibans from Kampung Merekai or Rumah Luang of Sungai Merekai, Batang Krang, Simunjan/Serian, Samarahan Division in another historic native customary rights (NCR) case, where the Court have ruled that the Plaintiffs have NCR over the land and that the Provisional Lease (PL) described as Lot 2979 Melikin Land District which is jointly held by Nirwana Muhibbah Sdn. Bhd. and the Land Custody Development Authority (LCDA) who are the third and fourth Defendants respectively be declared as null and void. Justice Datuk Linton Albert in delivering his judgement held that the Ibans have established their NCR over the subject land and that their NCR was never extinguished by any legislation or executive action. The Court found that the PL issued to Nirwana Muhibbah and LCDA in so far as it covers or includes or impairs the Plaintiffs’ rights over the said native customary land therein was null and void as it violated the Plaintiffs’ rights enshrined under Article 13 (1) of the Federal Constitution and Section 15 (1) of the Sarawak Land Code Cap. 81, and ordered that that the provisional lease be rectified to exclude the Plaintiffs’ native customary land. The Court further held that the third and fourth Defendants were trespassing into the subject land. The Senior Assistant Registrar will assess the damages suffered by the Plaintiffs. The Plaintiffs in this class action suit are represented by Luking Anak Uding, Simah Anak Empaling, Bari Anak Barien and Nyambar Anak Suwat. The Superintendent of Lands and Surveys Kota Samarahan Division and the Government of the State of Sarawak are the first and second Defendants respectively. The land dispute between the Plaintiffs and the third and fourth Defendants began sometime in 2001. Unknown to the Plaintiffs, sometime in October 2000, the first Defendant issued a PL for Lot 2979 Melikin Land District to the third and fourth Defendants for a term of 60 years. Numerous letters were written to the authorities and police reports lodged against the trespass of the third and fourth Defendants. However, no action was taken against the third and fourth defendants. On 30 March 2002, the Plaintiffs decided to file their class action suit at the Kuching High Court and trial started in March 2008. Harrison Ngau Laing represented the Plaintiffs while State Legal Counsel, Yap Khan Kee represented the first and second Defendants. Norida Anak Aipek and Ivan Hussein represented the third and fourth Defendants respectively. Tags: BRIMAS, Bari Anak Barien, Batang Krang, Federal Constitution, Harrison Ngau Laing, Ibans, Ivan Hussein, Justice Datuk Linton Albert, Kampung Merekai, Kota Samarahan Division, Kuching High Court, LCDA, Land Custody Development Authority, Luking Anak Uding, Mark Bujang, NCR, Norida Anak Aipek, Nyambar Anak Suwat, Provisional lease, Rumah Luang, Samarahan Division, Sarawak, Sarawak Land Code, Serian, Simah Anak Empaling, Simunjan, Superintendent of Lands and Surveys, Yap Khan Kee, native customary rights, nirawana muhibbah sdn. bhd.